The sword form known today as the Japanese sword was created in the 11th century. Superb works were created during the pinnacle of swordsmithing which occurred in the 13th century, the height of Japan's Kamakura Era. This period saw the birth of many master swordsmiths, among them Sanjo Kokaji Munechika, Awataguchi Hisakuni, and Rai Kunitoshi in Yamato province on the outskirts of present day Kyoto, and Tomonari, Ichimonji Norimune, Yoshifusa, Osafune Mitsutada and Nagamitsu in Bizen province, present-day Okayama prefecture. These men were commissioned by the samurai of their day to create the magnificient swords today designated as meito, or master swords. At the end of the 13th century, the Japanese military rulers predicted an upcoming war with Mongols, and they set out to strengthen the country's power and heighten the nation's chances in battle. The samurai warriors prepared beautifully wrought armor and helmets to wear into the battlefield, and they sought out the tachi created by swordsmiths. These developments led to the creation of magnificient and indeed beautiful tachi long swords during this period. The Mongols invaded Japan twice, in 1274 and 1281, and incurred great damage on the northern section of Kyushu island. These invasions also hastened the weakening of the Kamakura shogunal government. As part of shogunate and the imperial court's preparations for yet a third invasion, they ordered an ongoing round of kajikito rituals to be held at Buddhist temples and Shinto shrines throughout the nation. The shogunate donated tachi to these temples and shrines as offerings, and ordered taht they be used in these kajikito rituals. The Masamune is thought to have created his swords amidst these social and historical conditions. Masamune is said to have created many superb swords in Kamakura, Sagami province, but today swords signed with Masamune's own signature is extremely rare. The unsigned swords that have been attributed to Masamune and their splendid craftmanship have led to the high praise of Masamune as a master swordsmith. Today, Masamune is Japan's best-known swordsmith, far outstripping the fame of many other master swordsmiths. Masamune is thought to have been trained by swordsmiths from Bizen and Yamashiro provinces, such as Kunitsuna and Kunimitsu. Masamune himself went on to train many disciples, and the swordsmiths in the swordmaking lineages formed by Masamune's pupils continued to forge swords with Masamune's own particular characteristics. Shown in this page are swords made by Masamune, his teacher Shintogo Kunimitsu, his senior fellow Yukimitsu, his son Sadamune, other men of the Soshu School in the same province such as Hiromitsu and Akihiro, and the 10 Great Pupils of Masamune who gathered from various regions of Japan, namely Rai Kunimitsu, Hasebe Kunishige, Kaneuji, Kinju, Yoshihiro, Norishige, Naotsuna, Kanemitsu, Chogi, and Sa. There were three smiths, Kunitsuna, Sukezane, and Kunimune, who founded the Soshu tradition. However, the first blade which has been regarded as being produced in the Soshu-den was made by Shintogo Kunimitsu, known as "Midare Shintogo". Usually, he used suguha but this blade has an exceptional midareba hamon, which took a full one hundred years, from the start of the Kamakura shogunate, to develop. 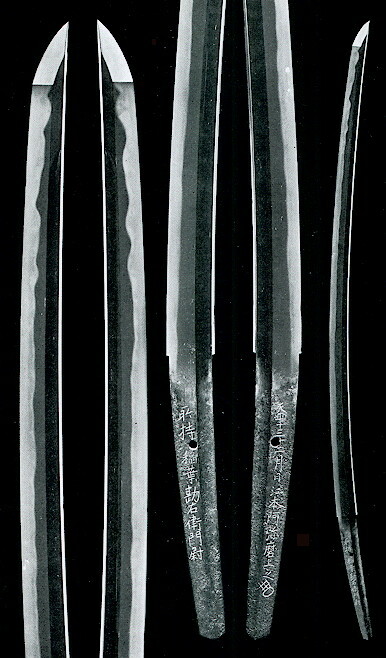 Kunimitsu's workmanship usually shows signs of the Yamashiro tradition and is similar to blades of the Awataguchi school. The oldest date on his work is 1293. Although having earlier studied the Awataguchi School of Kyoto, he created his own style. He educated Masamune, Yukimitsu, and Norishige. Yukimitsu was one of the pupils of Kunimitsu. The end of his active period was probably not later than 1334. His works are mainly limited to tanto and he used suguha while midare and hitatsura are often founded without signatures. 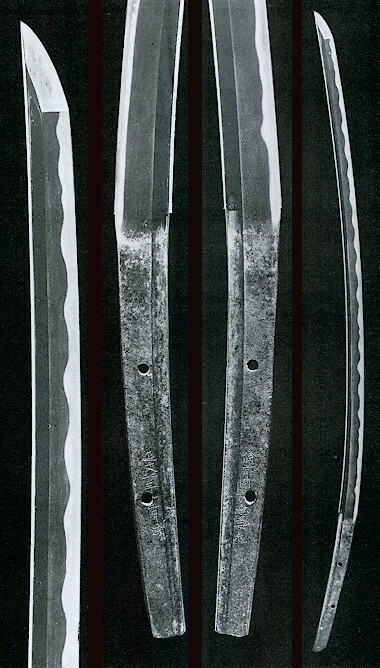 It is said that the horimono on blades by Yukimitsu and Masamune were carved by a man named Daishinbo. The old story regarding Yukimitsu as Masamune's teacher is chronologically wrong. Most likely he was a senior fellow student of Masamune and helped him to establish his style. Masamune's familiar name is Goro Nyudo. He studied under Kunimitsu and made blades in suguha but he made magnificient notare hamon which has never been found in Yukimitsu's. 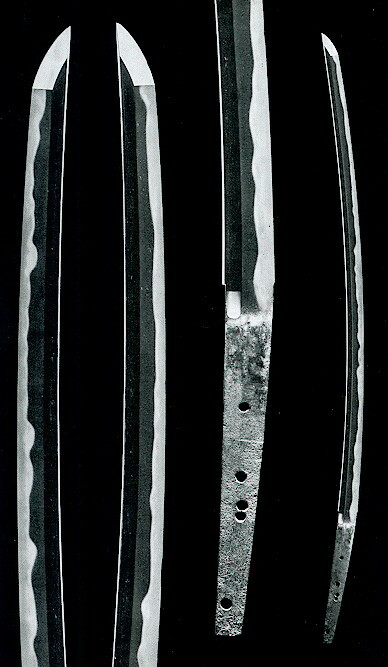 There are also some blades with ko-midare which appears to have been copied from the Old Bizen and Hoki styles. His works are well characterized by rich chikei and kinsuji, and beautiful nie. Signed works of Masamune are quite few. The examples "Fudo Masamune", "Kyogoku Masamune", and "Daikoku Masamune" are acceptable as his genuine works. Judging from his style, he was active from the late Kamakura era to the Nambokucho era. 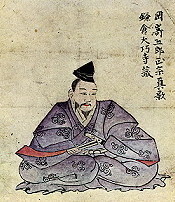 His works are the most frequently cited among the swords listed in the Kyoho Meibutsu Cho, a catalogue of excellent swords in the collections of daimyos edited during the Kyoho era by Hon-ami. Hikoshiro Sadamune is said to have been a son or adopted son of Masamune. He inherited Masamune's style very well and his skill was comparable to Masamune. His katana mostly have broad mihaba and large elongated kissaki. Most of his tanto are more than a foot in length, a variety termed wakizashi. This shows that he worked from the end of Kamakura to the Nambokucho era. In comparison with Masamune's work, he produced more gentle midare, and exhibited a variety of midare which tend to spread into a hitatsura. He was quite good at engraving horimono on blades also. No authentic signed work of Sadamune exists. A swordsmith referred to as Takagi Sadamune, who worked at Takagi in Omi province, is considered to be his pupil. Hiromitsu, a swordsmith lived at Kamakura in Sagami province, was said to be a pupil of Masamune or the son or a pupil of Sadamune. The oldes date found on his blades is 1350, which says that he worked during the Nambokucho era. The majority of his existing works are wakizashi of the hira-zukuri. Hitatsura is the most frequent hamon although a few have suguha. Akihiro, said to be either the son or the younger brother of Hiromitsu, worked at Kamakura in Sagami province. The oldest date on his works is 1362. His blades are mostly wakizashi and tanto of hira-zukuri type. Usually, he used hitatsura, which makes hard to distinguish from Hiromitsu's. Rai Kunitsugu was a man of the Rai school in Kyoto. Having reportedly studied under Masamune, he is popularly referred to as "Kamakura Rai" and produced many masterful tanto. Some of his blades show suguha and ko-midare which were traditional in the Rai school, but he often produced florid midare. His works among those of Rai swordsmiths are notable for their rich nie. Kunishige was a swordsmith in Yamato province, studied under Masamune, and later lived in Kyoto. It appears that the name Kunishige was used by three generations of his family or school. The oldest date signed Kunishige is from 1352, but some of unsigned blades show a style older than those of signed and even better in workmanship. His style shows wide mihaba, thin kasane,longer kissaki, and shallow sori. He produced many hira-zukuri tanto or ko-wakizashi of about 30cm in length. The hamon is o-midare with nie-kurure, and becomes hitatsura. Kaneuji was a man of the Tegai school in Yamato province, studied under Masamune, and moved to Shizu in Mino province. He is regarded as a founder of the Mino-den. There are sugata dating from the end of the Kamakura and from the Nambokucho era which has o-kissaki. He differs from Masamune in that hamon is tinged with gunome and jihada is mokume mixed with masame. It is a characteristic feature of the Mino tradition that togariba can be seen somewhere. Kinsuji, inazuma and sunagashi appear vigorously. Kinju moved from Suruga in Echizen province to Mino and then learned from Masamune in Sagami. His signed blades are extremely few and his works refelct the Soshu style and similar to Kaneuji's. The hamon is ko-gunome midare mixed with togariba. One of Naotsuna's swords has the signature "Naotsuna, inhabitant of Izuha, Iwami province" and a date of 1375, and there are some others which are even older than that date. Still these dates are a little too far removed from the period of Masamune's activity. Zai-mei are rare and usually mumei as a result of o-suriage. Tanto are few, hi are common, but horimono is rare. The yakihaba is irregular and hamon is o-midare mixed with uniform gunome. His style shows some characteristics of the Soshu-den but he is a little bit inferior to Masamune's other students. Go Yoshihiro lived at Matsukura-go in Etchu province. He was one of the most famous Masamune's students and later called even superior to Masamune. His works are mostly o-suriage. A little larger kissaki, but no o-kissaki, can be seen. The jigane is beautiful, oily, and well forged. The jihada is mokume mixed with o-hada, or occasionally mixed with masame. Abundant ji-nie, chikei and yubashiri appear. The hamon is based on wide o-notare, the bottom area starts with a smaller pattern which becomes larger in the monouchi area. Norishige lived at Gofuku in Fukie of Etchu province. He is popularly referred to as Gofuku-no-go. Since the Edo era, he was regarded as a pupil of Masamune, but an older story which sounds more reasonable says that he was a pupil of Shintogo Kunimitsu. His signed works exist both tachi and tanto. The kissaki never becomes larger and tanto has a fukura which is not rounded, and uchi-zori. The jihada is a distinctive matsukawa hada and hamon is gunome midare with nie kuzure, ashi, and sunagashi. Kanemitsu was a representative of the Osafune school in Bizen province. The dates on his blades range from 1331 to 1370. Kanemitsu is said to have been the name used by two generations of smiths in the main family of the Osafune school. 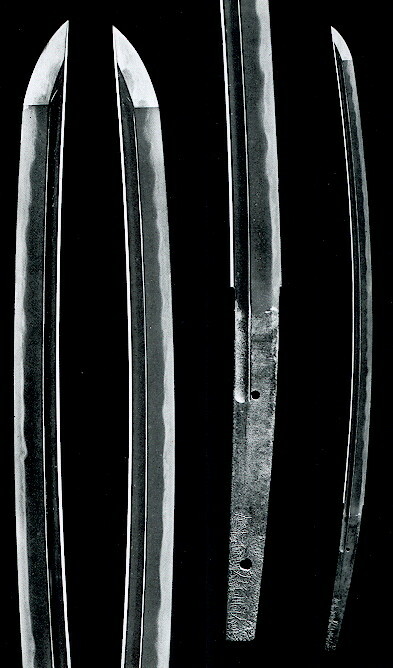 The first generation was Kagemitsu's son, and a blade dated 1331 is the oldest. Workmanship of Kagemitsu, whose sugata shows typical of the late Kamakura, with hamon that are uniformly kataochi gunome consisting of nioi, continued to the Nambokucho era. Beginning in the Bunna era(1352-1356), the style of Kanemitsu changed remarkably. The sword known as "Embun Kanemitsu" dated 1356 is said to be a work of second generation and almost in the notare style. Chogi was a man of the Osafune school, in a different branch from Kanemitsu's, in Bizen province. His works include those in the traditional Bizen style and those showing what may be regarded a derivation from the Soshu style. His career, however, cannot be associated directly with Masamune's, for the dates of his existing works are never earlier than 1360. Therefore, his elder brother Nagashige who left a sword dated 1334 is more close to Soshu-den of Masamune. The jihada of Chogi blades is itame with mokume, or occasionally pure itame hada. His vigorous hamon bears a resemblance to the hamon of Soshu Akihiro, Hiromitsu, and the Samonji school. "Sa" is the abbreviation of Saemon Saburo Yasuyoshi, an inhabitant of Okinohama, Hakata in Chikuzen province and a worthy inheritor of the tradition of the Chikuzen school. He is called Samoji as he used just the character "Sa" as his name when signing his work. He was also called "O-Sa"(Great Sa) and said to have been Jitsua's son. Sa didn't copy his father's work, a style that is commonly seen in Kyushu. His work is much more sophisticated than that of other Kyushu smiths, with easily recognizible, conspicuous signs of influence of the Soshu-den. O-Sa was active from the end of the Kamakura through the early Nambokucho. His works can be roughly classified as two groups: Chikuzen style with suguha and masame hada; and those with midare mixed with gunome and ko-mokume. Questions or comments? Email Elliott at Shibui Swords.